Organize meetings around actions rather than territories. How To build a more productive team or host a more focused meeting. True Confessions: The approach to organizing groups described here is not rooted in deep research or dozens of sociological studies (repeatable and not so repeatable). It is rooted in mere observation. Years of observation. Being a teammate. Sitting in meetings. You know you've been part of a team that had too many members. Or members with individual agendas. Many of those meetings were scheduled; some impromptu. Many promised agendas; most rambled. Some proved productive, far too many delivered only vague outcomes. At times, next steps were defined; but too often only loosely so. In more instances than one cares to count, there have been 15 or more people sitting around a table, even lining the walls. And this heavily populated meeting is a reflection of the “team” assigned to deliver an outcome. Think back. In nearly EVERY case, only five or six people truly contributed value to the topic. These few actors participated in discussion; they focused on the topic, they recognized the project or problem at hand; they proposed ideas, offered solutions, executed a task that contributed to that fabled synergistic whole. If you examined the scene, only a handful of participants truly made valuable contributions. Out of this uncomfortable, but honest, observation comes an organizing principle for establishing participation in a team or meeting. Only on rare occasions should there be more than six people on a team or in a meeting. Invite only five or six people to join your team or attend your meeting. Invite more than that and you're not holding a meeting, you're holding a sit-in. It is a lecture and should be labeled as such. Further, your team or meeting is more likely to deliver if it features one clearly defined challenge or problem. NOT a clunky list of loosely defined topics. Yes, the team should have an objective, the meeting should have an agenda. But the more vague the objective or the longer the agenda, typically the more parties get involved. It is almost always wiser to have more frequent, shorter, single-focus teams or meetings than a big omnibus gathering. Teams and meetings are not spectator sports. Host single-topic, narrow time-frame teams and meetings that expect, even demand active participation from each member. Another observation that drives this view is that in so so many situations, TERRITORY rules. Ego reigns over assignments and outcomes. Ego exerts influence to protect its territory. Territory requires boundaries, silo’d agendas, passive-aggressive barriers. Geography stifles cooperation and sterilizes collaboration. And even when engagement occurs, it tends to be governed by rules designed to preserve the boundaries, rather than deliver genuine interaction that advances a cause or addresses a purpose. Fiefdoms are walled off and while they may expand at first, ultimately, they become stale and may even lead to collapse. Given these two key observations, a rule of thumb for roles in a meeting emerges: Fewer viewers. Only doers. Turn down the observation. Ramp up the participation. Require each meeting to be guided by VERBs. Not by ego, territory or departmental geography. Limit your event to five or six smart people working together to meet a challenge or to solve a problem or to address whatever topic drove the call to meeting in the first place. Verbs vs. Nouns. Active vs. Passive. Participate vs. Spectate. Do vs Be. Imagine a traditional ad agency. The model provided the experiences that shaped this view of teams/meetings. Other business models will parallel the agency biz. Like most businesses, the ad agency tends to be assembled in departmental chunks: account management, creative, media, operations. Today's agency also boasts digital and social and data and analytics and project management and .... each is measured by head count, staffed with directors and managers and VPs and senior this's and junior thats. The more department-oriented the challenge, the more members attend, the higher their status, the more attendees become auxiliary and some become outright outsiders. whoever you are, bring your verb to the table. How might an agency re-think the way it forms teams or arranges meetings in this approach? Let's sample some verb-al explanations. Of course, you may assign/define your own verbs. As long as yes, you just do it. This is the executive function. It is guided by vision, investment, connections, influence, ownership, etc. Its action is to decide, to sanction, to approve, to initiate, etc. It's not kicking back or lording over. It's actively playing a role in the process and the outcome. And if it's not business ownership, then it's someone who “owns” the challenge, project, relationship. etc. It is authority that is vibrant, clear and present, not remote or distant or foregone. Focus: responsibility for the business, culture, goals; presence in the community (business and otherwise); and profitability. Focus: identifying points of contact or interaction, media channels, planning/buying; from door hangers to chats, pixels to podcasts, Jellies to Super Bowls. Allowing for a certain cringe-factor, this verb suggests the creative department. Its filter is development and execution. It's engineering and manufacturing rolled into one. Perhaps. So the smart person representing this perspective is ready with what-ifs and how-tos to achieve possibilities. Never in isolation. Always in the context of the other dynamic inputs. Focus: messaging; as in what to say, how to say it, how to make it ... you know, the manufacturing arm of an agency. This verb should probably appear first in the graphic. However in practice, discussions can start anywhere; participation is likely non-linear, filled with mixing, re-mixing and leap-frogging. A good meeting may only rarely be orderly, but that needn't mean it lacks direction. Properly activated, this verb sets up everything else the meeting is meant to DO. Data, research findings, insights, definitions, competitive analysis, monitoring, whatever information can help guide strategy, suggest direction. All those static elements are brought to the table through this activity with the goal being to energize an active, collaborative endeavor. Focus: research (qual, quant, ethno, BIG), account planning, analytics, KPIs, anything that has to do with preparing and then monitoring insights and effectiveness. Whew. Could be the most important verb. Yeah ... let's make it an action verb. In a traditional sense, this verb correlates to “operations.” The CFO or the COO govern these territories. “Resourcers” bring “asset management” into the fray. What resources do we have (or not have) that can be activated to meet this challenge? This role demands realistic assessments, but in the true spirit of “getting things done,” it also must be liberated to think in terms of “what-ifs.” (See it's creative, too!) What-if we move this resource over here? Or swapped out that asset for this one? What if we invest in this to generate that? Limits are opportunities in work clothes, to wrangle a phrase. They are not rigid barriers. They are invitations to think - and act - in new ways. Focus: Everything it takes to OPERATE your business, from microprocessors to human processors. Big territory here, running silently in the background until providing license or asserting reality checks in a meeting or for a team. Manage, handle, supervise, oversee ... any of these “integrating” terms fit here. But the “Five-Or-Six” approach is not a top-down approach. It's flatter, even “holocratic.” Meeting participants are self-managed equals. This verb might be about relationships, too, representing the owner of the challenge. At the end of the meeting, someone needs to own coordination of assigned or accepted activities and confirming outcomes determined by the group, sanctioned by, approved by a decider. Focus: This verb is about actively representing the challenge your team is meeting. And may be active out there in the world finding the next challenge to overcome. Those six verbs are examples. The intent is to dramatize “doing;” each member of the meeting actively participating. Not hovering or feigning attention or just loitering around on the fringes. Take a penetrating look at how you organize meetings and see what verbs are not merely relevant, but are actually crucial to the business objective. Be alert to the role everyone PLAYS in contributing to the business objective. Of course, you may assign/define your own verbs. So. What About The Smart Part? Any member of the team or meeting who is actively engaged in contributing ideas, knowledge, insights, what-ifs is demonstrating smarts. Intelligence is not established by decree, degree or certification. It's established through participation, through bringing focused, unexpected thinking to the mix. Re-mixing is a powerful problem-solver, making unexpected connections, layering knowledge from different disciplines (or verbs in this case). The pool of actors a team may draw from to populate a meeting is dynamic. Not everyone available displays the same zeal for participation. The most productive outcome may be delivered by having some naysayers in the mix - as long as that player is engaged. In any group, there are members who are on board; they're believers in the cause or purpose, mission or goal. They're probably easy to spot. And there are folks out on the fringe who may resist the business goal or culture. They may at moments appear almost hostile to those goals. These resistors may be waiting for some reason to move toward a belief -- or move out entirely. These are not bad people. They may be motivated by the other factors. Test them to find out. You actually want this mix. If you build a team strictly out of believers, you facilitate echo chambers and group think -- hot topics of late given the power of algorithms in social media (not to mention the human algorithm of comfort). But narrowing in or closing down exploration are very real issues today. Build your team or host your meeting to keep things lively, open -- and active. Experts, by nature, are preservative/conservative. You may solve a new problem with an old solution. If so, all may be well, or just efficient. But you may often find your team seeking a new solution to a problem (long-standing or just perceived). Bring in the wild card member, an innocent, (a resistor or tester? ), someone who represents a seemingly distance set of experiences. And invite surprise. The intent here is not to utterly discredit expertise. It is intended to question authority and avoid routine solutions. No effort is required to be a noun. A little work, at least, is necessary to be a verb. To do. To act. After all, we are human beings. Human = noun. Being = doing. So if you want to avoid the lecture circuit and achieve something, pull your verbs together and get going. PS: Maybe this was a long way of echoing what they call, at Amazon, “two-pizza teams: a team that is small enough to be fed by two pizzas.” That reference provided by Tim O'Reilly in an EconTalk interview. PPS: This “five or six” actor model could work in other industries. Just for kicks, check out the sketch below. It depicts how a network services firm might parse out a set of verbs/roles - rather than territories - to activate business structure, teams and/or meetings. In the true spirit of verbs: Go for it. Different businesses, different verbs. But the same rules apply: Fewer Viewers. Only Doers. Actors, not spectators. Actions, not territories. Why Don't Social Networks “Go To Work” To Stem The Tide Of Advertising And Even Help Make Us More Productive? What if social networks became platforms that expose us to opportunities to do work, as well as serving up content and, yes, even advertising? “Working for each other is the great theme of human history.” We seem to have forgotten Mr. Ridley's truth here in the age of social networking. “Working for each other” requires exchange. And what makes humans unique among earthly creatures is the capacity to exchange dissimilar goods or services. Thanks to communication, there is a capacity to negotiate, to agree on the equitable values on both sides of the exchange. Human trade goes beyond mere reciprocity (of which there are some examples in the animal kingdom per Mr. Ridley). We are social creatures, too. Look no further than the inflationary growth in social networks for evidence. And ... we humans indeed enact exchanges in the age of social networks. Citizens of the social platforms share information with each other in Facebook and LinkedIn and Twitter and SnapChat, etc. And those exchanges on a personal or social level may indeed be reciprocal. What If Social Networks Became Free Agent Marketplaces? What if social networks offset the advertising burden on eyeballs with opportunities to do work? They could become free agent marketplaces alongside all that sharing, in sync with the growing trends in the world of work. Today, social networks of sharing are foundational in the “attention economy.” Free is paid for with “eyeballs.” Exchanges, certainly of the monetary kind, are one way. The platforms are transactional - in terms of monetary value - in one direction, to the platform hosts. To some degree, there is participation without compensation. More to come on that matter. Tim Wu ( @superwuster ) laments this “attention” economy -- which is fundamentally a one-way “trade” that benefits the host. Jaron Lanier skewers this one-way model, too. Doc Searls (co-author of the seminal Cluetrain Manifesto and author of The Intention Economy @dsearls ) lobbies actively for the Intention Economy, which is fundamentally a two-way “exchange” that benefits both sides of the equation in a more reciprocal way. In his view, if companies can manage the customer relationship (CRM), then customers should be able to manage the vendor relationship (VRM) and ALL the data that goes with it. Tomorrow's social networks of doing could be foundational in an “intention economy.” Free is paid for with opportunity. Exchanges, certainly of the monetary kind, would be two-way. Wouldn't a two-way scenario be more equitable? More sustainable? More true to what makes us human - per Mr. Ridley. Sure, advertising can and will still play a role in generating revenue. (Even the most elevated of hosts won't give up/back all that advertising revenue.) But why couldn't opportunities for work be exposed to those same eyeballs? And why couldn't the member - now in more a active capacity - be able to choose the form of compensation, including cash or its equivalents? WHAT ARE THE CURRENCIES NOW AND WHAT COULD THEY BECOME? Members are compensated in the form of content (information, entertainment) in exchange for joining, sharing, updating, attending, clicking. We don't think of those activities as work. But work is being done in the shadow of those activities. Members are essentially data factories, churning out information about likes, dislikes, interests, behaviors. It's autonomous, like breathing. Members are the data robots of the social networks. Third party companies (advertisers) mine that data, profiting themselves (ostensibly) and the platforms (obviously) to shape product development and brand messages and sales pitches back to platform members. Attention is the price of access to the platform, where members enjoy the content shared by peers and other content generators, while also being exposed to the relentless advertising feed. Social networks serve up “take it or leave it” memberships. Since one joins for “free,” the tacit agreement is that members tolerate, accept, attend to whatever serves the interests of the host. Of course, the host argues that what it serves up is filtered by a member's profile. Members enter information, they share interests, their status, position, preferences, sentiments and more. The aggregate of these posts builds up a data mine that is researched and analyzed to discern insights that will shape further content that, yes, algorithmically reflects the members' interests, as well as those of the platform and the advertisers. Endless loop. Vicious cycle. Established. Members generate information, share interests and yield insights in exchange for information or entertainment, which are valuable content. They also accumulate status (not always as intended, perhaps), which amounts to a highly valued social currency. So there is, not to be doubted, a very real exchange happening in these networks. Again, on the horizontal peer-to-peer level, this exchange is essentially reciprocal. Hear, Here: It is in the host-to-member vertical where reciprocity is shattered - the transaction is one-way, almost entirely to the benefit of the network host. Transactions are take-it-or-leave-it exchanges. Members accept these terms by virtue of creating a free account. There is no negotiation. “Accepting the terms” is just how it is (as it is with so many other online access agreements -- see Doc Searls blog post here). Side Note: Yes, there are ad-blockers, but why should users be forced into a defensive posture? Because we are defending ourselves, our privacy, our data, the topic of consumer sovereignty is picking up steam. Doc Searls published (May 25, 2017, an essay on consumer sovereignty -- referring to “consumertech”(VRM) vs “adtech,” “martech.” Cass Sunstein explores consumer soverignty in this EconTalk interview re his book #Republic. Compare the Attention Economy and the Intention Economy. One greatly favors the host over the member, while the other rewards both. Eyeballs are engaged in both. 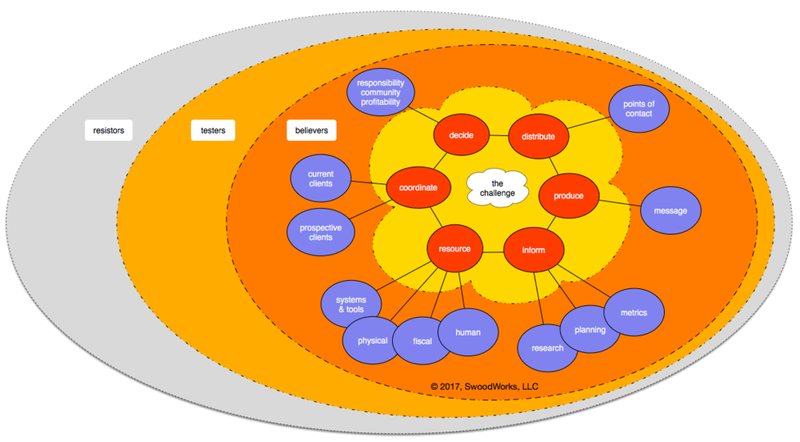 The Intention Economy gives power back to the member - as spec'd by Doc Searls - and balances the playing field. Engage Idle Capacities In The Social Network To Become Producers, Not Just Consumers. The contention of this article is that the platform hosts have side-stepped entirely another way to leverage the network, its membership and the data generated. What they have side-stepped is the notion of doing purposeful work, targeted to appropriate members and then compensating those members for the product of their labor. Set up an alternative revenue stream - work - and reduce the pressure on eyeballs to attend to the burgeoning tsunami of advertising. And awaken an entire world of productivity in the process. Replicate the investment and technology applied to filtering preferences for the purpose of serving up advertising and serve up - to those same appropriate eyeballs - opportunities for work and compensation. To the work done passively, add work to be done actively. Invite ideas and solutions to problems. Offer up outright tasks. The network charges the “employer” for the posting based on the ask. The network builds a margin into that fee, as well as compensation to the member for work performed. To the currencies of content and status, add experience and cash equivalents. Opportunities may be engaged on a first-come-first served basis. It may be a “crowdsource-like” opportunity, which likely embraces some sort of competitive elements. The opportunity could be narrowly or broadly targeted, based on the information the social network already has (or expands upon) about the member. Task and terms must be transparent and complete from the outset. Proven mechanisms for effectively handling distributed challenges can be adopted/adapted to this scenario. The platform can automate the manner in which the opportunity is represented -- just as say Facebook and LinkedIn do for advertising now. The exchange need not be rigid. The offerer can outline options and compensation in the scope of the assignment. The member can choose which currency to accept in exchange for fulfilling that assignment. Perhaps the exchange is made for dollars, bitcoin, credits, etc. Perhaps the work is done in exchange for seeing content without advertising! The Concept of Distributed Work Is Already Proven. There are business models who are operating outside of “free.” Idea generation is already proving to be a viable type of distributed work. Consider Betterific. It operates as a kind open platform for people to simply post ideas. But it also operates on the enterprise level. It is competitive, but contributors can earn cash payouts typically in the form of Amazon gift cards. In social networks, the “workers” are already assembled, on a heretofore unimaginable scale, with far deeper, wider data collection technology. Yes, the platforms were established for sharing. They began as free. But however free at the beginning, at some point there must be monetization to continue as a business, to continue serving up the content the eyeballs “demand” and the advertising the business model requires. Who wouldn't agree that only a small percentage of the advertising has value, regardless of how successfully personalized and targeted the filtering algorithm is. The bulk of advertising is distraction. There must be a saturation point at which membership falls off. Let's Work For Each Other. Members. Businesses. Neighbors. Networks. The reality is this: an opportunity to “work for each other” as civilized human beings (Mr. Ridley) can be served up for consideration in the social network of doing. Terms are transparent, negotiated (possibly) and agreed to. Or not. The ask may not have been appealing, the member may not have had capacity or interest, the compensation may not have been agreeable. Or it may have matched all those criteria and the work is performed. It's that simple. Reciprocity is added back into the exchange. Reboot the currencies. Welcome transparency. Create a virtuous cycle. The internet has long promised to undo the unintended consequence of television: a passive, spectator-pleasing world. Indeed, social networks permit participation well beyond clicking the remote. There is interaction, but as far as social network hosts are concerned, that interaction has been defined as just another kind of clicking. On advertising and links. Is that all we want from this expansive new connected experience? If we can evolve social networks of sharing, make them social networks of doing, the internet can deliver on its promise: replace passivity with activity; turn spectators into players, convert observers into actors. After all, what good is a network if the net doesn't do work? Social Networks Of Doing: It's time to put the networks to work. Facebook, Mark Zuckerberg @finkd, Microsoft/LinkedIn, @satyanadella! Let's do this. Note: From an HBR interview with Doc Searls: “Well, the intention economy is an end state. I see a lot of things called the “fill in the blank economy.” This topic, among others, is alive here at what is still essentially the frontier of the digital age. One day, there were will be fewer labels to wrangle. The above argument begins with “social networks of doing.” The goal is to move the discussion beyond social networks of sharing. But finally - and it does so without any permission from Doc Searls - the idea of “doing” would actually become an active part of The Intention Economy - a world where the consumer plays a far more active, intentional (rather than incidental) role. The above is Part 2 of We Have Social Networks of Sharing. It's Time To Create Social Networks of Doing. We Have Social Networks Of Sharing. It's Time To Create Social Networks Of Doing. Regarding the role of Crowdsourcing in The Gig Economy. It can be worthy. As long as one gets the gig because of the gig without being gigged. The Scarce-Capacity Theory of Boredom & Crowdsourcing. What? The entertaining and informative folks at Freakonomics often explore topics related to how we work. When listening to their podcasts, links to crowdsourcing inevitably come to mind. Recently (10/29/2015), Stephen J. Dubner addressed the topic of boredom, which appears to be a notion that was unheard of until after the First World War.